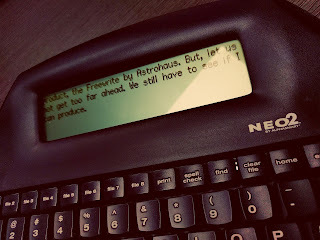 In anticipation of writing this blog, I went out and purchased the Alphasmart Neo 2 from eBay. The device cost around $30. It is obviously used, although not very. This device, on which I am writing this blog post, is a step towards undistracted writing. It seems that many writers are opting for devices that are dedicated to writing. A search online will give you advocates of devices such as the Alphasmart Neo, the Freewrite, good old fashioned typewriters, old computers running DOS and a word processor, full-screen apps on the computer or web, and even dedicated home made devices running on a Raspberry Pi. Such is the problem of distraction inherent in all-in-one devices, such as laptops, phones, and tablets, that writers are looking for solutions to be able to practice their craft with complete focus. Given that I am aspiring writer who is known for being distracted, it made sense to nip the problem in the bud. I ordered the Alphasmart Neo 2 from eBay as an experiment. If this device boosts my writing output, then it might be easier to justify the purchase of another product, the Freewrite by Astrohaus. But, let us not get too far ahead. We still have to see if I can produce. Other than this blog, I am also working on an urban fantasy novel. In addition, my work is partially knowledge work. I have to write documentation for my work, which could also benefit from undistracted writing. So, there is more at stake than the occasional blog post writing. The main concerns I have are not technology-related. I feel fairly confident that the technology of the Alphasmart Neo 2 is dependable. I could see the device lasting a long time, years. My main concern is how the product will fit into my workflow. How often will I be able to break free from the laptop for some untethered writing? How convenient will it be to transfer files every day? How likely am I to want to travel with the device? Questions such as these can only be discovered after having used the device for some time. As it is, I have only used it for a few days. I will set a reminder to review the device again in three months.